Game developers have many tools at their disposal to monetize: a wide variety of formats to select from, several ad mediation options, ad servers and programmatic tools to derive optimal returns. While each of these tools has practical use, it’s truly the flexibility for developers to select and easily apply the appropriate tool in a given scenario. We call this the Swiss Army Knife Approach to monetization—multiple monetization methods at the disposal of developers. There is more than just IAP monetization, there’s multiple ad monetization tools, subscriptions, physical goods, etc. The average mobile user spends a majority of their time on their mobile devices playing games. Yet despite this massive pool of engaged attention, game developers spend a comparatively smaller amount on mobile ads than their non-gaming peers. We’re all familiar with the thinking behind this: the developer’s concern over ads negatively affecting game experience and a fear that in-app ads could cannibalize revenue from IAP. Allow me to dispel these concerns with a few examples from partners of Fyber. Royal Revolt 2 from Flaregames let’s users create and defend a fantasy kingdom. This popular game fits nicely into the midcore genre—defining those key, engaged moments in the loop is essential to monetizing. Once those points are defined, creating a compelling call to action that delivers meaningful, timely value to the user is key to success. In the case of Royal Revolt 2, we worked with the talented people at Flaregames to introduce a series of phased rewarded video engagements at key moments in the game. The most obvious starting point was to introduce a simple rewarded video placement in the game’s store where players go to make IAPs. Success was modest here, with an engagement rate of 6% to 7%, but of course there was additional revenue produced. 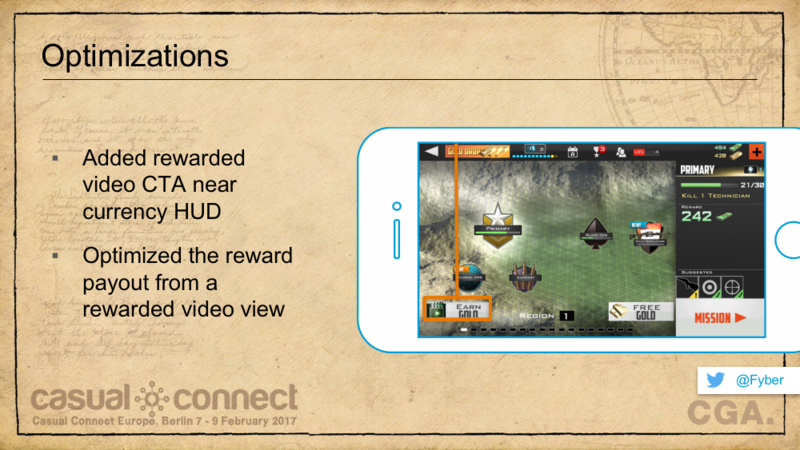 This initial success led to phase 2: introducing rewarded video options in the game experience itself. In Royal Revolt 2, there is a staging screen that users visit in-between individual battle sequences. In order to move on to the next battle, users must first build up enough food supplies to feed their armies, something which can take time to do. The strategy employed at this point in the loop was to offer food resources as a reward for watching a short video ad. By doing so, the user could build up their required resources quickly, thereby accelerating their ability to get into more battles, sooner. As a result of this, user engagement with ads more than doubled to 15%, leading to more revenue and higher ARPDAU. These were good results, but we wanted to push even further. Flaregames struck gold in phase 3 by introducing the user to video ads with random rewards, in this case, a secret chest with unknown goodies. Users loved it. Engagement with the ads skyrocketed to 55% right away and eventually reached 71%—an extraordinary engagement rate by any measurement. This deep engagement drove superb returns, increasing Royal Revolt 2’s ARPDAU by 10X. The developer’s takeaway from all this should be that smart ad placements pinpointed to key moments in the midcore loop are an excellent application of the rewarded video format. Kill Shot by Hothead Games is a first-person shooter with more than 65 million downloads. Hothead wanted to maximize the number of players interacting with in-game ads, but were also sensitive to maintaining a quality user experience and not cannibalizing IAP revenue. Between missions, users visit a screen where they can purchase additional supplies. Hothead introduced a rewarded video placement in Kill Shot‘s HUD. Similar to the phase 3 offering in Royal Revolt 2, the reward Kill Shot players earned by engaging with the video ad was a surprise—the simple message was: engage and you’ll get something good. The results were superb. On iOS, ad exposure jumped 89%, and ARPDAU from video ads rose a whopping 125%. On Google Play, the numbers were almost as impressive—a 54% increase in ad exposure and a 67% rise in ARPDAU. At the same time, IAP actually grew, dispelling the myth of ads cannibalizing IAP. Lastly, we worked with a well-known Japanese game studio to implement rewarded ads in their hit fantasy RPG mobile game. In this case, the developer wanted to let data prove the validity of rewarded video. To do this effectively, it was necessary to create a series of A/B tests that divided users in groups based on whether or not they engaged with a rewarded video ad. 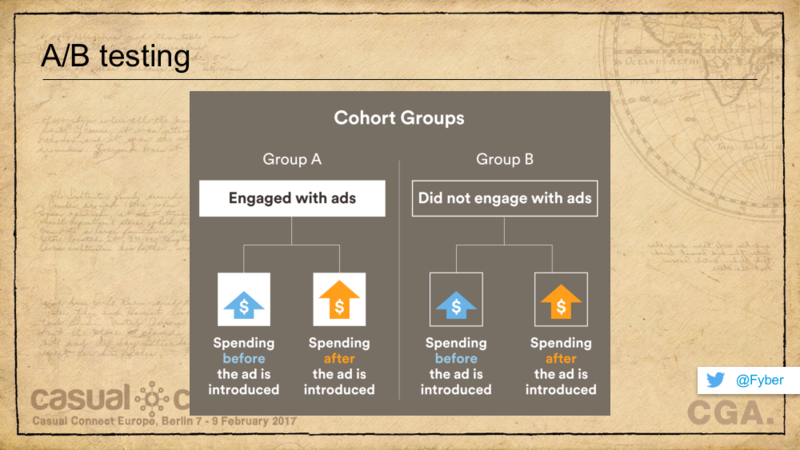 Of the two primary cohorts, group A were those users that did engage with an ad, while group B was composed of those who did not. In each case, we measured behaviors and spending patterns both before and after rewarded video ads were introduced. The outcomes of this testing prove, once and for all, that rewarded video ads are not a detriment to IAP, but an amplifier of it. Simply, users from group A (those who engaged with a rewarded video ad) were twice as likely to make an IAP compared to users who didn’t engage with an ad. This resulted in an IAP increase of between 40% and 100% among the various subsets of the group A cohort. Very importantly, we were able to prove that user retention rates for those who engaged with these ads presented together with IAP experiences doubled. Successful ads feel like they are part of your game. They present themselves at moments of deep engagement in the game loop and reward the user with something they value. A creative and agile approach to determining reward types and values is essential. Paying attention to performance data from across formats, ad servers and mediation tools is critical to honing your most high-performing rewards and maximizing ad yield. Rewarded video doesn’t cannibalize IAP. 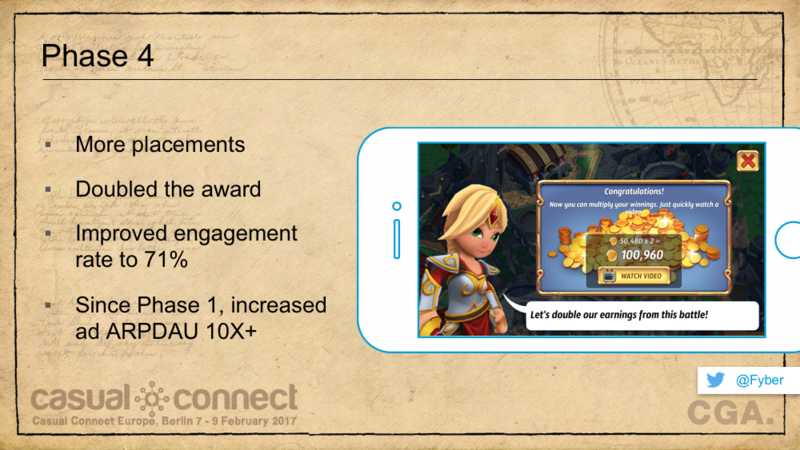 By introducing intelligent, well-crafted rewards at key moments in a game, developers can deepen engagement, increase ARPDAU and even improve retention.